Creative Borders hardboard photo panels are a unique, modern way to preserve and display your special photos. The gloss white finish allows for vibrant colors and a crisp, clear image. 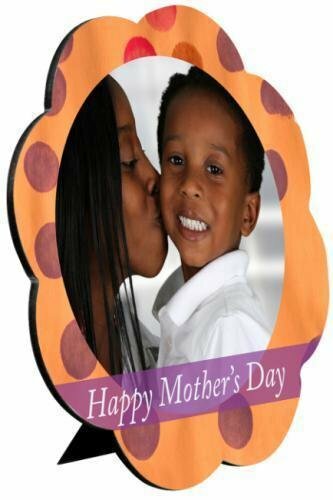 Available in several shapes that are UV and scratch resistant, the panels have a black edge that frames your photo and a mini black aluminum easel that comes with a pre-attached adhesive for easy table top display. They also work great for small signage created with your own graphics or logo. Creative Borders hardboard photo panels are a unique, modern way to preserve and display your special photos. The gloss white finish allows for vibrant colors and a crisp, clear image. Available in several shapes that are UV and scratch resistant, the panels have a black edge that frames your photo and a mini aluminum easel that comes with pre-attached adhesive for easy table top display. They also work great for small signage created with your own graphics or logo. This elegant picture frame made of leatherette, a faux leather material, is a truly unique way to showcase your favorite photos. The frame personalizes to black for a stunning contrast to the rawhide. The back is felted and features both an easel and hangers for horizontal or vertical wall or table display. Available in several sizes, this frame offers a lot of photo display options. This elegant picture frame made of leatherette, a faux leather material, is a truly unique way to showcase your favorite photos. The frame personalizes to black for a stunning bold contrast to the rose'. The back is felted and features both an easel and hangers for horizontal or vertical display. Available in several sizes, this frame offers a lot of options for photo display.